Three young trainees who joined the Kick Start Café in Riverwood North last year have found jobs in the hospitality industry after successfully completing a 10 month long industry program. Locals, Ravin Lotomau, Joshua Antwi and Paniora Nukunuku graduated this month with a Certificate III in hospitality, barista accreditation and RSA and RSG certificates. They celebrated their graduation at a special ceremony attended by representatives from supporting businesses and community bodies. The Kick Start Café is a social enterprise initiated by leading Australian property and investment company, PAYCE and supported by Riverwood Community Centre, St George Community Housing, building company DASCO Australia and Schibello Caffé. Kick Start Café is now being incubated by the PAYCE Foundation, aiming to build it as a sustainable social enterprise with a model which can be replicated on other sites and other developers. Each trainee was guided through on-the-job experience and the TAFE course by the café’s head chef, Shane Hillard, who, with 30 years of experience in the hospitality industry, was thrilled with the success of his latest trio. “Since the Kick Start Café program commenced three years ago at Washington Park, 10 young people have completed their training and gone on to secure jobs in the hospitality or related industries,” he said. The café, located on Kentucky Drive at Washington Park, is well patronised by local residents and businesses, as well as nearby construction workers. PAYCE Director, Dominic Sullivan said PAYCE was extremely proud of the graduates and the program’s success in supporting youth and equipping them for a positive future. “The Kick Start Café has been an outstanding social enterprise initiative and we could not be more pleased with the opportunities it has provided,” he said. “The trainees have gained some wonderful experience, not only with food and beverage preparation, but also interacting with customers and other businesses. “That has built their confidence and developed leadership skills that will benefit them throughout their working lives,” he said. 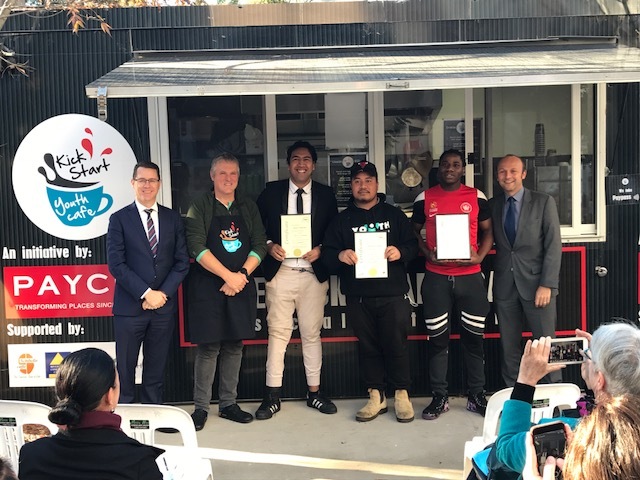 With the three latest graduates moving on to permanent jobs, the Kick Start Café’s 10 month program has just taken on its next batch of trainees. Sixteen year old Jonas Masters, 18 year old Aaron Subritzky and 19 year old Jonny Burt are all keen to gain hands-on experience and pursue careers in the hospitality area. Mr Sullivan said he hoped more local residents and businesses would support the café and the program. “Please drop by and say hello to the café’s new recruits who, I am sure, will be only too pleased to serve you and make you welcome,” he said.